The Portfolio Decarbonisation Coalition presented the results of an investor research titled "Back to the laboratory: are global chemical companies innovating for a low-carbon future?" at an event organised by Finsif, CDP and Sitra on 25 August 2015. The theme of the event was "Managing climate risk in investments". 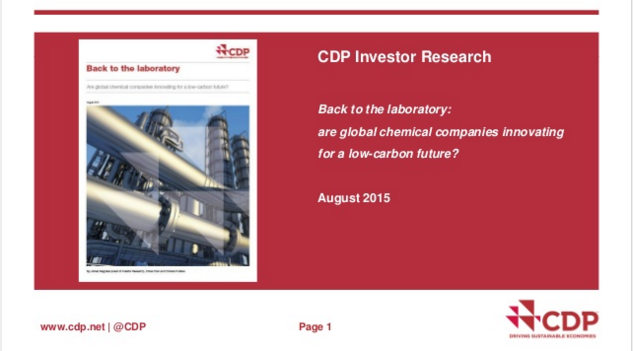 The Portfolio Decarbonisation Coalition presented the results of an investor research titled ”Back to the laboratory: are global chemical companies innovating for a low-carbon future?” at an event organised by Finsif, CDP and Sitra on 25 August 2015. The theme of the event was ”Managing climate risk in investments”.